There are many ways to complement every figure to make a girl look stylish, but nothing beats the use of complementary colors. 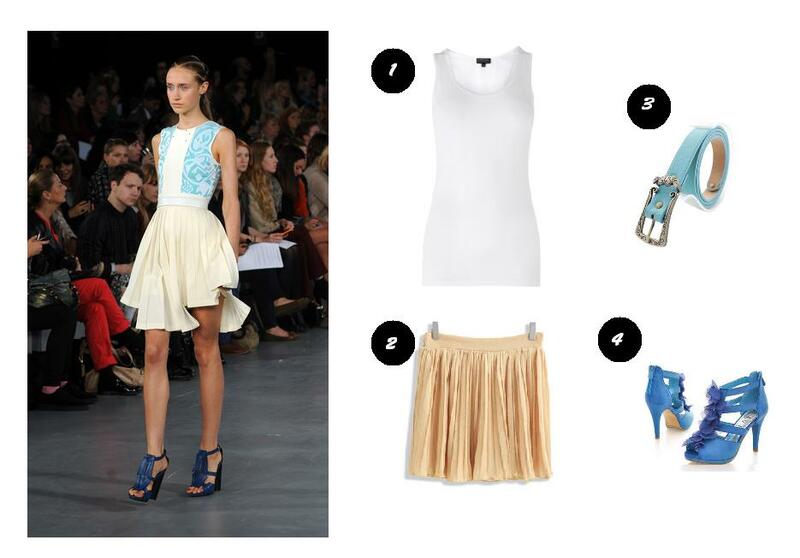 You don’t need to be an art student to execute this fun and flirty look, just say hello to the colors blue and yellow and keep reading to learn how to get this complementary chic look by David Koma for less than $100. The Look: This look comes to us from fashion designer David Koma’s Ready-to-Wear Spring 2012 collection featuring light colored whimsical ensembles. The outfit is a dress consisting of a pale yellow pleated asymmetrical skirt attached to a round neck blue-and-white sleeveless top matched with dark blue heels. Some designer looks are just too one-of-a-kind, especially when it comes to copying certain prints for a college-girl-friendly budget, but nonetheless, we’ve essentially nailed the look. This is certainly a great outfit to celebrate the last bit of warm weather, and though it’s not as versatile as many of our other looks, it sure is trendy. Fashion Tip: Whenever you are going for an ensemble based on complement colors, beware of adding any other colors that are analogous colors to either one of the complementary ones. This will ruin the entire look. Instead, if you want to add more colors, stay within the color family. For example, the runway look was paired with dark blue heels, which is perfect for this look as blue is already featured in the print found up top. If you have a look you want us to Look for Less for a future article, shoot our fabulous editors an email of the look and let us do the rest!